Quintessential historic village tucked away in a spectacular valley. Filled with Colorado's largest glacial lakes reflecting the highest peaks in the state the scenery is unforgettable. Once you see it you will be drawn to return over and over. Fish the lakes for 25# Mackinaw Trout. Climb Mt. Elbert, Colorado's highest peak and there are a dozen more 14ers within 20 miles. The quaint little town is mostly preserved with a hotel from 1879 and an historic park with interpretive signs and a visitors center to learn more about the history of the area. Across the lake is the historic luxury resort of Interlaken. In the process of being totally restored there lots of great stories depicted on the information boards. As you take a great hike out to it you will see Mt. Elbert reflected and look down to see the trout swimming in the crystal clear waters. If you keep your eyes open you might spot some of the resident osprey fishing for their meals. Boating of all sorts is permitted on the lake. I like the zen like experience of kayaking. Wildlife is abundant and you will see elk, antelope, deer, fox, bear and hopefully no pumas. The hiking trails are endless and so is the adventure. 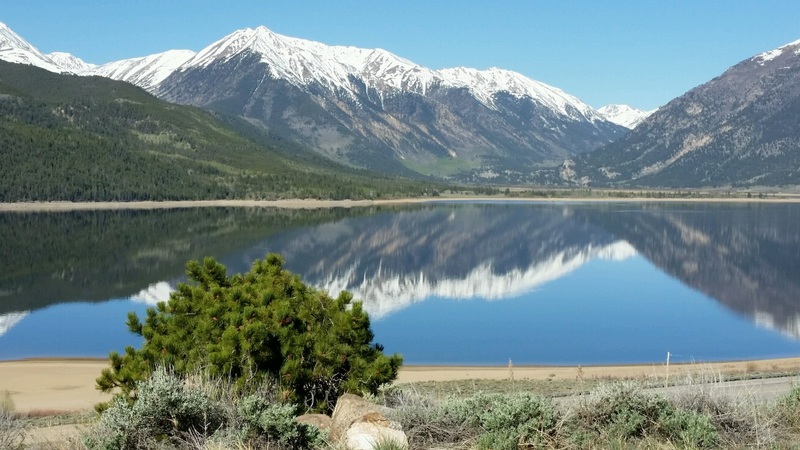 Twin Lakes is a truly natural Colorado experience.